E.M. Burton prepares an athlete’s meaty dream dinner, then shows how to put it into the Zone. “We’re all just one meal away,” someone said to me early in my training. I found the idea quite heartening. No matter what you ate yesterday, you’re only one meal away from having balanced blood-sugar levels. The idea that each and every meal could be so important struck me. I wondered if we thought that way more often, wouldn’t we put in more effort to make each meal special? This was all more of a daydream, really, and might have stayed that way if I hadn’t started making videos about meals. Each episode in the Kitchen Disaster Film series is based on taking someone’s absolute favorite meal and—if necessary, and with slight modifications—bringing it in line with CrossFit nutritional guidelines for athletic performance. And yet, while several of the videos have appeared on CrossFit.com and in the CrossFit Journal, only one of the published videos has retained that special-meal characteristic of the series’ original intent. It takes skill to produce a fine stove-top steak. E.M. Burton explains. Both meals look tasty to me. While I'd certainly prefer the one with the large steak, I'd happily eat either. The picture of the Zone meal in this article really illustrates a personal issue I have with the Zone, though. Maybe someone can help me with it. The three blocks of grilled vegetables in that picture represents a lot of food. Also, since I personally don't want the wine, I'd end up almost doubling that amount to make it to five blocks. That's a TON of food. It's hard to transport (to work) and hard to eat. It also makes the meal into a tiny bit of what I want (the steak) and a huge amount of what I'm merely tolerating. I might be willing to manage it for the sake of fitness, except for two things. First, my Zone prescription is 22 blocks. You may not believe that, but I've had body fat measurements done multiple times using several different methods, and every time the results say I should eat 22 blocks on Zone. So, I end up trying to eat that huge mound of vegetables and tiny portion of meat FOUR TIMES EVERY DAY, not to mention an additional two-block snack somewhere. Second, my results seem to be no different whether I eat Paleo or Zone. Since I see no benefit from one over the other, I choose the one that lets me eat more of what I want, without the hassle of measuring everything, and without choking down tons of greens. BUT, every few weeks an article appears in the Journal implying that I should really be doing the Zone. So, how should I handle the carb blocks? I've tried using fruit instead, which is almost the same problem as the vegetables (two and a half apples per meal, basically). Eating an entire sweet potato every meal isn't horrible, but it's not exactly vitamin-rich. Eating bread gets the job done, but taking in that much gluten upsets my digestion. Any other options? That is the problem with not WAM...its sooooo easy to inhale a 16oz steak...not ideal. It may seem tricky to do 22 blocks of veggies assuming you are calculating everything correctly and not over estimating the activity factor, but it can easily be done. Sweet potatoes are pretty nutrient-dense, I think. I have no problems with regular potatoes and rice (so called "safe starches"), but some Paleo purists would take issue with those. As you know, fruit is also a good option. Stick with it...its a great way to be precise. I guess I'm a Paleo (more correctly Priml) purist...no counting of blocks...I simply follow the primal blueprint, keep carbs low, eat/cook with the right oils, grass-fed beef, organic veggies when I can, nuts and seeds, some wine and don't worry much about calories (although I track them with "lose it" app on iphone) and don't have much problem maintaining my weight...as long as I don't overdo anything...seems much easier than worrying about a "zone"...eat as we evolved to eat and all will be well. Now, I need to get consistent on my workouts! Also, do the research on grains, legumes, etc...lots of info on how bad today's processed carbs are, including "complex, whole wheat, etc. 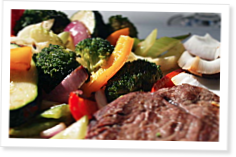 "...started paleo/primal a few months ago and couldn't be happier. Where can the Kitchen Disaster film series be found?